Pancake tortoises are 1 of 53 tortoise species that inhabit Africa (where they reach their greatest diversity), North America (where 4 species reside), Europe, South America and Asia. 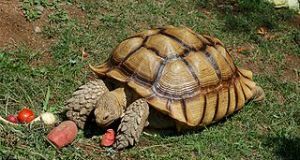 Terrestrial and largely vegetarian, tortoises range in size from the Aldabra tortoise, Geochelone gigantea, whose carapace approaches 5 feet in length, to the speckled tortoise, Homopus signatus, which is fully grown at 4 inches. Pancake tortoises, the sole member of their genus, possess a carapace (upper shell) that is flat or even sway-backed, and so flexible – a result of gaps between the rigid, bony plates – that it can easily be squeezed between thumb and forefinger. Colored yellow-tan with dark rings, the shell provides excellent camouflage. The limbs and tail are brown, tan or yellow-tan in color. Pancake tortoises reach 6-7 inches in length yet are merely 1-1 ½ inches in “height”. Their flattened profile strains our conception of what a tortoise “should look like” – one that came under my care was found wandering about Jamaica Bay Refuge in NYC (a released pet). A park visitor had rushed it to the ranger’s station – distraught over the plight of the animal, which he believed, understandably, to have survived being run over by a car! This tortoise’s uniqueness does not end with its appearance – when threatened, it runs off in a most “un-tortoise-like” fashion and wedges itself deep within a rock crevice or below a boulder. The flatness and light weight of the shell and the highly flexible legs assist in this endeavor. Once within a crevice, the tortoise rotates its powerful forelegs outward to lock itself in place. It has recently been discovered that a flexible, diamond-shaped area on the plastron (lower shell) also rotates outward when the legs are withdrawn, rendering the animal even more immobile. Even this ingenious defense is not, however, foolproof – a species of hawk with very long legs has been observed lying on its side, snatching tortoises from within their shelters. Individuals rarely forage far from a favored retreat, and return un-erringly to specific rock fissures when displaced. Amazingly acrobatic, they can even climb vertical rock crevices by utilizing a maneuver similar to that known as the “chimney climb” among human rock-climbers – the carapace and legs are wedged against opposite sides of the crevice and, maintaining constant pressure, the tortoise inches its way upward. Pancake tortoises are found only in southern Kenya and northern and eastern Tanzania, including within Serengeti National Park. Limited to rock outcroppings (kopjes) and rock ledges on savannas in areas of arid scrub and thorn-brush, they rarely cross open land. Therefore, the populations (which are quite dense, for a tortoise) near each kopje are more or less reproductively isolated, and local extinctions are easily caused by over-collecting. They forage for dry and growing grasses, leaves, succulents and seeds in the early morning, late afternoon and evening, and shelter in deep rock crevices during the heat of mid-day. Some populations aestivate during January and February, the hottest times of the year. 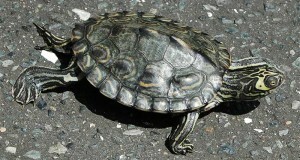 Pancake tortoises make fine pets, but extreme care should be taken to assure that you are buying captive bred animals. Over-collection for the pet trade has decimated their numbers, and their low reproductive potential and limited natural range puts the species at additional risk. They are classified as “Vulnerable” by the IUCN and listed on CITES Appendix II (under consideration for inclusion under Appendix I). Click here: The Natural History and Captive Husbandry of the Pancake Tortoise to read the rest of the article. The photo above is courtesy of Adam Darrenkamp of the Lancaster, PA Herpetological Society. They meet at the North Museum in Lancaster, PA.